We go further – As standard. Our ‘look see’ drainage scan proves its worth time and time again. 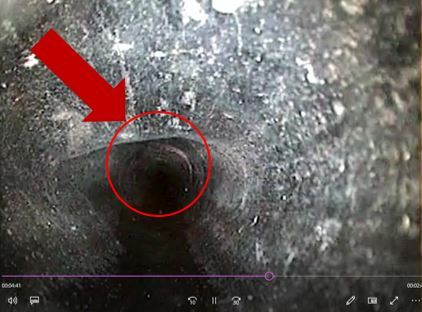 Depending on the drainage channels their length and condition, defects below ground could be costly. A ‘look see’ drainage scan provides you as a potential purchaser, an eyes wide open perspective of the property. We have recently identified a series of defects to a number of drainage systems which we have inspected. Including blockages, shallow falls, misalignment, deformation and collapse. Information such as this allows repairs to go underway at the earliest convenience without tarnishing the excitement of moving into a new home. Our ‘look see’ drainage scans are included as standard within our intermediate level (ISVA) and Level 3 Building Surveys. Above: A deformed pitch fibre drainage channel.